NEW ORLEANS – Randy Moss spiced up Wednesday's Super Bowl media session by expounding upon his Media Day declaration that he's the greatest receiver of all time, causing some of us to react as though we'd just ingested an undue amount of jambalaya. "What I think, is what I think," Moss said Wednesday. "I changed the game." I covered Jerry Rice as a beat writer. I knew Jerry Rice. 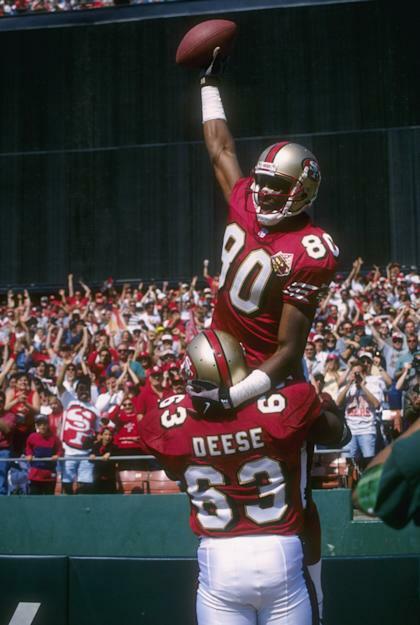 I watched Jerry Rice defy medical science and embarrass defensive backs. Randy, you're no Jerry Rice. However, as tempting as it is to spend the next 20 paragraphs explaining precisely why I believe the current San Francisco 49ers wideout's career pales in comparison to that of the retired ex-Niners superstar, among others, I decided to reach out to some folks who are uniquely qualified to assess the claim on its own merits. And in talking to some of the two receivers' most esteemed contemporaries, I got reactions ranging from respectful quibbling with Moss' choice of words to outright indignation. "First of all, Randy Moss is held in contempt," said former Atlanta Falcons and Indianapolis Colts cornerback Ray Buchanan, who played against both Rice and Moss on multiple occasions during his 12-year career. "He has not at all obeyed protocol for wide receivers. And with all due respect to Randy Moss, I had to do a lot more film study to get ready for Jerry because I had to get ready for every route. He ran every route available, to perfection, and he ran them all the same, so it was almost impossible to stop. With Randy, I didn't even have to watch film, because it was all about the 'Go' route." In NFL circles, there is little debate about Rice's greatness. "Jerry is like MJ – the greatest ever," says former Pittsburgh Steelers star Hines Ward, comparing his fellow Super Bowl MVP-winning receiver to basketball legend Michael Jordan. "There will never be another one like him." When I asked Hall of Fame running back Marshall Faulk about the Rice vs. Moss debate, he answered, "What debate? Why do I need to comment on something that doesn't even merit discussion?" Suffice it to say he shares my views regarding Rice's superiority. Yet, somewhat surprisingly, I found several of Moss' and Rice's peers who believe that the former could make a legitimate case for being the most dangerous receiving threat the sport has known. "Randy Moss is 'The Guillotine' because he'll chop your head off with one play," said future Hall of Fame defensive tackle Warren Sapp, who was Moss' teammate with the Oakland Raiders in 2005 and '06. "You remember when they used to put two people on him and he'd still catch it? Even when the safety was over the top, Randall Cunningham would still throw it? And Brad Johnson couldn't throw it far enough to reach him? "What's the scariest thing to defensive coordinators and players? The 'chunk' play. Randy Moss is the ultimate chunk play. And as a defensive player, that's the one thing you didn't want to face. So if Jerry was the greatest, maybe Moss is the scariest." Eight-time Pro Bowl receiver Cris Carter, a mentor to Moss when they were Minnesota Vikings teammates from 1998-2001, also believes there is room for nuance in the argument. "I wish Randy had said 'greatest deep threat' instead of 'greatest receiver,' " Carter said. "Jerry struck a lot of fear in defenders, but there was a whole different set of fear with Randy. He could gut you right now. He could score from anywhere on the field. And from an athletic standpoint, there is nothing I would take Jerry Rice over Randy on. "Jerry is more complete. When it came to route running and yards after the catch, a term they invented because of Jerry, he was the greatest. Most of all, when Jerry stands before God, he'll have gotten everything possible out of his ability. When Randy stands before God, he'll still have some left." Former NFL cornerback Eric Davis, a teammate of Rice's in San Francisco from 1990-95 and a man who covered both receivers during his 13-year career, agrees that work ethic, drive and attention to detail helped set Rice apart. "Jerry is the greatest receiver, period," Davis said. "You had to defend the entire field, because he ran every route. Randy, with his size and speed and hands, is the greatest deep threat we've ever seen. There's a reason we called him a 'freak.' There are very few that have ever had that type of impact. But he would still fall short of Jerry Rice, the greatest impact player the game has ever seen." To Davis, Moss' uneven effort and unwillingness to go across the middle were other areas that kept him from reaching Rice's level. "He could have gotten more out of his ability," Davis said. "How many big plays did he leave on the field by not going across the middle? You played Randy outside-in, so you would be in position to see the deep ball. You knew he wasn't going to run in-routes and run away from you. With Jerry, it was a chess match, because he ran every route – curl, deep dig, slant, go, post, out, you name it – and they all looked the same." Buchanan gave a similar assessment, saying, "With Moss, it was like checkers. With Rice, it was like chess. It was a totally different ballgame. I'm gonna be honest with you – a lot of defensive backs don't want to mention that we're nervous or intimidated at our position. We've got our egos that are strong. But me coming from Indy and coming to [the Falcons in] that division [with the 49ers], I honestly had tornado storms in my stomach." Sapp, however, said he and his fellow Tampa Bay Buccaneers defenders were petrified of Moss. "All we're arguing about is words," Sapp said. "Because Randy could have said, 'I am the greatest, shiniest weapon that's ever played,' and he'd be right. Jerry Rice was like Zorro's sword, slicing you up with precision and skill and making you die a slow death. Randy Moss is Excalibur. When nothing else works, you pull out that sword and it's instant death." As I suggested earlier, I could talk a great deal about Rice's maniacal drive and hypercompetitive nature – the way he constantly focused on the smallest details, pushed himself and his teammates and viewed every play (even those on which he was a decoy) as a chance to set up an opponent for a potential advantage later in the game, or even in the next game. To me, it felt right that he was the one who enjoyed unprecedented success on Sundays, because everything I'd witnessed from Monday through Saturday suggested he'd prepared the hardest and cared the most. We could spend a long time talking about Rice's numbers; he owns virtually every meaningful NFL receiving record, and Carter basically pointed to his statistical superiority Tuesday when questioned about Moss' comments. Even Moss's claim to fame, breaking Rice's single-season touchdown reception record in 2007, should come with an asterisk: Moss caught 23 TDs in 16 games; Rice, during the strike-shortened 1987 season, had 22 TD receptions in 12 games. "Randy Moss says he's not worried about statistics," Buchanan says. "Well, statistics do matter." I also saw Rice dominate numerous postseason games (and Super Bowls), while Moss flat-out quit in the Vikings' 41-0 defeat to the New York Giants in the 2000 NFC championship game, among other postseason indignities. Remember the infamous water-squirting incident? Perhaps Moss' absurd antics, such as his notorious dressing down of a caterer during his second stint with the Minnesota Vikings, have caused me to underestimate his impact as a player. On Super Sunday, the soon-to-be-36-year-old receiver won't likely strike much fear in the Ravens' secondary, but there absolutely was a time when his presence raised the pulse rates of opposing defenders and coaches. To Davis, because of Moss' body of work, the man who once said "I play when I want to play" can say what he wants to say. "If he wants to say 'greatest wide receiver ever,' because of his effect on the game? He's a Hall of Famer, so that's his right," Davis said. "But Jerry Rice? We're talking about the greatest football player of all time, pick your position. He's the greatest, end of story."